Kitchens, bathrooms and bedrooms are typically the rooms in any Keller home that get the most use, which could also be why homeowners, when surveyed, consistently cite those rooms as the ones they most want to renovate. It makes perfect sense to upgrade the rooms where you spend the most time, but in high-traffic areas, you can’t afford to make changes just for the sake of cosmetics. You want improvements that can enhance your enjoyment of a room and its functionality. Here are five smart improvements to make in the rooms people voted as the most popular ones in their homes: kitchens, living rooms, bedrooms, bathrooms and game rooms. Adding skylights is a practical, cost-effective and attractive way to bring more natural light into virtually any room. Solar-powered fresh-air skylights provide not just natural light, but passive ventilation, a real plus in kitchens and baths. Adding solar powered blinds, in designer colors and patterns, increases energy efficiency while giving you total control over the amount of sunlight entering a room through the skylight. If you already have older glass or plastic bubble skylights, you can upgrade to the latest solar powered models, plus solar blinds, and receive a 30 percent federal tax credit on the products as well as installation costs. 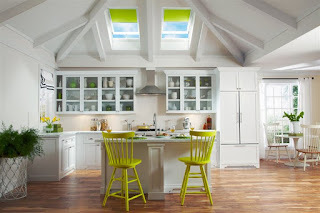 You can even bring more natural light into rooms or areas without direct roof access, like half-baths, closets and hallways, and with sun tunnel tubular skylights. Air flow is critical to the health of your Keller home and everyone who lives in it. Ventilation in kitchens and bathrooms carries away excess moisture that can cause mold and mildew, and creates a fresher, more healthful environment by exhausting stale indoor air.